Do you remember when nearly every police car on the planet was a Ford Crown Victoria, Crown Vic, for short? Not only were all police vehicles essentially the same, but they were also outfitted with the identical emergency vehicle light set-ups. Well, those days are long gone! 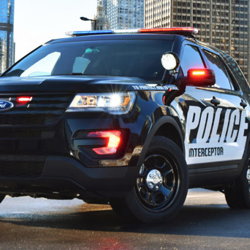 Obviously, Ford is still a leader in the police vehicle market, but it’s best-selling model nowadays isn’t even a sedan, it’s the Ford Explorer SUV. 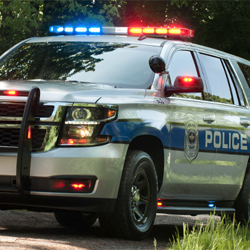 With so many vehicles to choose from, we wanted to make it easy for agencies to buy vehicle-specific police lights. We already offer affordable, fair pricing, and now we’re making it even easier to shop too. Below, we've broken down the most prominent makes and models offered today and listed what LED light bars, and other equipment will work best. What are the most popular police vehicle makes and models? 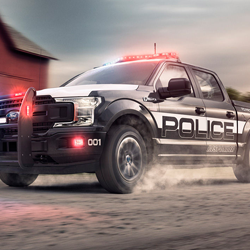 Studies show that Ford owns the police vehicle market with a whopping 61% of fleets on the road bearing the company’s emblem. But, they aren’t the only major automobile company in the game. 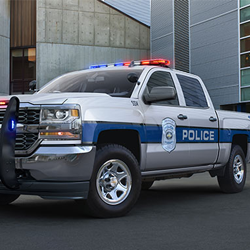 Dodge and Chevy also have a few makes and models that are extremely popular with law enforcement agencies. Below, we’ve come up with options that will make customization and fitting fast and easy. When Ford retired the Crown Vic, many industry insiders thought they’d put themselves out of the first responder business. However, they proved everyone wrong and now have four models that are often purchased by police departments. 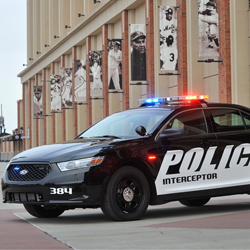 The Ford Interceptor is built for police work and available as a sedan or SUV. 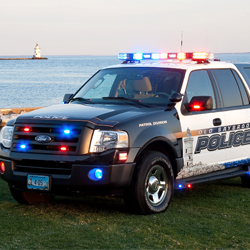 Ford’s Expedition, Explorer, and F-150 are also used by agencies all over the country. The Explorer is Ford’s most popular make and model now, and the F-150 is popular with K9 handlers and those that have to cover harsh terrain and remote areas on a regular basis. We’ve outlined specific police lights that will work with each of the models listed above. If you have any questions about these Ford-specific police lights, please contact us, and we’ll be happy to help you choose. 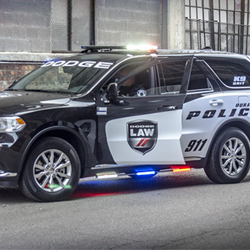 Dodge and Ford fans have gone at it for years, so there’s some contention regarding whether Dodge will someday take over the first responder market. 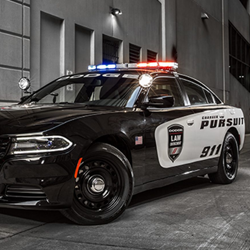 Right now, departments are purchasing the Dodge Charger all over the country because of its impressive pursuit capabilities. Dodge’s SSV (special service vehicle) the Durango, sometimes called the Dodge Defender, is often used by jails and prison transportation. 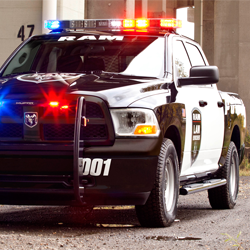 Lastly, the RAM 1500 is another favorite K-9 unit that is built for comfort and power. The Ram and the Durango can be purchase as AWD or 4WD units, so each model is ideal for use in harsh terrain. Here, you’ll find our recommendations for Dodge police lights. Contact us by phone or email with any additional questions. Last, but not least is Chevy. 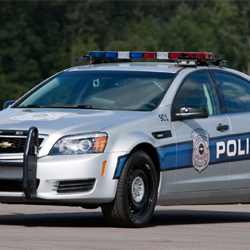 Chevy models used by law enforcement include the Impala, Caprice, Tahoe, and Silverado. The Caprice stands out for Chevy because it is an impressive and highly regarded pursuit vehicle. It also has the most interior space out of all the other sedans on the market. It’s powerful engine, and roomy interior make it a popular patrol car. 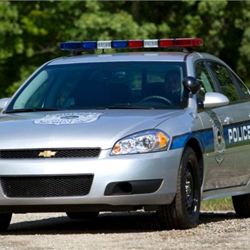 The Impala is another excellent patrol car option while the Tahoe and Silverado are extremely popular for departments that will inevitably have to put the vehicles through punishing conditions such as rapid changes in elevation and harsh winters. The police specific emergency vehicle lights that we carry here, are made with an excellent understanding of each make and model discussed. We understand agencies need to outfit fleets quickly and affordably. By following the suggestions we’ve listed here, you can maximize your budget and simplify installation and upfitting, which will help you get a department’s vehicles on the road as soon as possible.